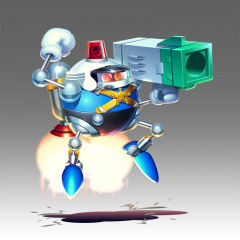 The Hard-Boiled Heavies are an elite squadron of Eggrobos built by Dr. Eggman who appear in Sonic Mania. The Hard-Boiled Heavies themselves were just ordinary Eggrobos that were modified by the mysterious power of the Phantom Ruby they were sent to excavate to represent certain themes and to hold more firepower, though the power seems to have loosened a few of their screws, granting them free will. Throughout the game, the Heavies would engage Sonic, Tails and Knuckles in boss battles, usually at the end of Act 2 in place of Eggman (the Heavy Gunner being the exception, as he is fought in Act 1), though each character only gets to fight four of them in a normal playthrough. Much later on in Titanic Monarch Zone, Eggman masters control of the Phantom Ruby and uses it to further transform the Heavies into "Phantom" versions that attack the heroes during the final battle against the Phantom Egg. Heavy Gunner - Armed with a missile cannon, he is fought in Studiopolis Zone Act 1 as a mini-boss. Heavy Shinobi - Armed with Asterons and an icy katana, he is fought in Press Garden Zone Act 2 as a boss. Heavy Magician - With illusory tricks up her sleeve, she is fought in Mirage Saloon Zone Act 2 as a boss, and ambushes the heroes during Act 1. Heavy Rider - Riding around on a Motobug named Jimmy, she is fought in Lava Reef Zone Act 2 as a boss when playing as Sonic and Tails. Heavy King - The leader of the Hard-Boiled Heavies. Fought in Lava Reef Zone Act 2 as a boss when playing as Knuckles. He is also fought in Egg Reverie Zone when Sonic has collected all the Chaos Emeralds.